ISLAMABAD: The Malaysian government is in preliminary talks with Pakistan for the export of JF-17 Thunder fighter aircraft, reported Janes. The disclosure was made by an official from Pakistan Aeronautical Complex on the sidelines of the Defence Services Asia 2018 exhibition in Kuala Lumpur. According to the British publication, the governments of the two countries were engaged in “primary level talks” about the sale of the fighter jets. The aircraft is expected to cater to the combat requirements of the Royal Malaysian Air Force. The British publication also revealed that Pakistan had expressed willingness to enter into a possible deal with the local industry in Malaysia to facilitate localised manufacturing, as well as maintenance, repair and overhaul. “Of course, the industrial engagement would depend on the sale of the Malaysian requirement,” the official told Janes. In 2015, the same news agency reported that a high ranking Malaysian official had confirmed that the country was considering the purchase of JF-17 jets from Pakistan, but Kuala Lumpur had swiftly denied the report the following day. The Royal Malaysian Air Force has been looking to procure a twin-engine combat aircraft for more than a decade, but a lack of funds has hampered the search. The Diplomat reported that the Malaysian forces intended to purchase 18 new fighter jets to replace its existing fleet of Mig-29 aircraft. The procurement was expected to support the fleet of F/A-18D and Su-30MKM fighter jets already in service with the air force. However, budgetary constraints in 2017 put a damper on their efforts. According to the Tokyo-based magazine, Sweden, China and Russia are also interested in selling aircraft to Kuala Lumpur, but the Pakistani JF-17 Thunder is the cheapest option for the Royal Malaysian Air Force. “Powered by a Russian designed but Chinese license-built Klimov RD-93 (an RD-33 derivative) turbofan engine, [the JF-17] can reportedly reach a top speed of up to Mach 1.6 and has an operational range of up to 1,200 kilometres without refuelling,” the author of the report in The Diplomat underlined. The fighter jet, featuring seven hardpoints, can be armed with a variety of weapons including air-to-air, air-to-surface, and anti-ship missiles. 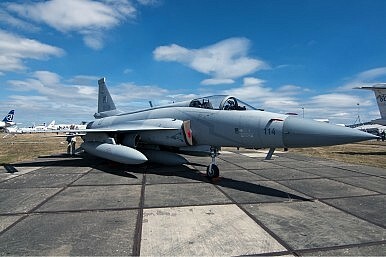 Interestingly, JF-17 is a feasible option for Malaysian forces because the engines in the Pakistani jets are also used in the Mig-29, and service and maintenance facilities for it are already in place.